Blogging strategy is not something to take lightly: There needs to be a lot of planning for your blog to be a success. Unfortunately, most business blogs exist just because it “seems to be a thing”: There’s not much planning or measuring behind it. Today we are offering an easy plan for you to follow, i.e. turning your blog into a content hub. Cheval John @chevd80 is no stranger to our chats. Apart from being a regular contributor, Cheval was also a host teaching us niche social media marketing. 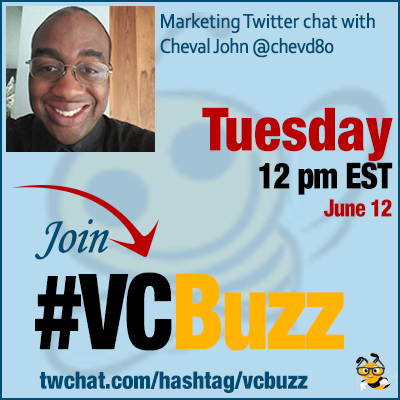 Just a reminder: Cheval John @chevd80 is founder and CEO of VallanoMedia, LLC, a marketing agency which helps small to mid-sized businesses build a loyal audience via social media. Q1 What types of content are there and what are the benefits of each one? There are educational type of content which informs the reader about the changing world of their particular industry. There are technology blogs which keep up with what is going on in the changing world of tech. There are also now podcast, live video which it’s purpose is to make life easier for the consumer and allow them to make a decision on whether you are worth following or doing business with. Q2 What is a content hub and why is it so powerful? A content hub is a place where people can find valuable information whether it is a podcast or live stream. I would say your website should be the place to have a content hub because all of what you produce is all yours. If you are running an online business, you should make your website the one stop shop for all of the content because you can not run a business on rented land (social media). The biggest mistake most brands and influencers are doing is putting all of their content or business on social media to build an audience. The recent algorithm changes with Facebook and updates to Youtube proves why you should build all of your content on your website (mainly blogging). Q3 How to turn your blog into a content hub? You basically provide valuable content on a weekly basis that solves a particular pain point related to what you do. You also have to understand your audience too. Look at twitter chats or other places to see what they are chatting about because mostly you will get your ideas for a blog. Most people repurpose their podcast on their website and include show notes for those who do not have the time to listen. They can also have the replays of their live stream shows on their website too with key points made. Q4 Please give a few examples of content hubs and note what makes them effective / original? @redbull is one example of a content hub because they provide documentaries surrounding their products. @cheddar is another example of a content hub due to the fact they did not have their live stream network confined to one social platform and their website is the base for distributing content to other platforms. @expwriters is a huge example too of a content hub because @juliaemccoy basically focused on long form blog posts in the early years of her company before adding a podcast and other resources to the website. Q5 What are your favorite content planning and creation tools? I am going old school on this answer: my notebook as it gives me the opportunity to write out what type of content I am going to put on the blog and of course twitter because I can see what type of conversations are happening.